Category: Automated Handling. Tags: bakery oven loader, oven loader. This unit is available as single and two stage loaders. The unit is constructed in stainless steel sections, fitted with standard stainless steel table top slat or heavy duty acetal chains and is designed to group individual tins or trays. Trays are the indexed onto the loader conveyor to form the desired batch length. Once the batch is completed, the batch of trays is transferred onto the oven band via a rack and pinion driven pusher assembly. The pusher arm can be pneumatically raised and lowered to assist increasing loading speed. 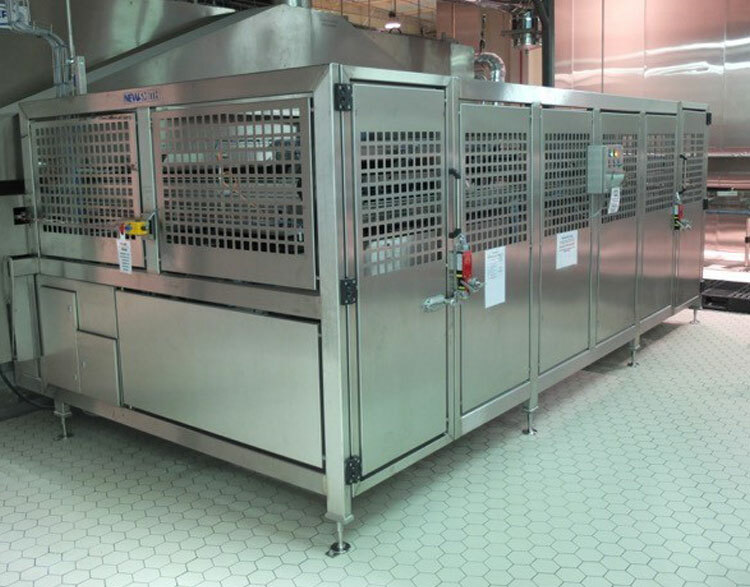 The complete unit is guarded with 2 metre high stainless steel mesh frames incorporating interlocked access doors.